Of Mícheál Ó Cléirigh it could be truly said, ‘bheadh sé molta da mbeinn im thost.’ (He is praised, even if I were to remain silent). In the 50 years at the end of the last century, innumerable articles and not a few books have referenced him, his work and his life. It was said of him that ‘his labours in the cause of Irish history, literature and language saved our country’s records from obliteration and our native tongue from extinction.’ An achievement of truly gargantuan proportions. Who Was Mícheal Ó Cléirigh? These are some of the questions that will be addressed by the Mícheál Ó Cléirigh School over the coming years. The basic facts of Mícheál Ó Cléirigh’s life are well known. For the people of Ballyshannon and Rossnowlagh districts, he was a local man. He was born in Kilbarron Castle at Creevy on the shores of Donegal bay. He was Irish, of Gaelic descent and from ‘a hereditary learned family of professional historians.’ His exact birth date is not known but was probably around 1590. There is no precise date for his entry to the friars. The best we can say is that he was a member by March 1623. Before that he may have soldiered for the Spanish Crown in the Spanish Netherlands. In 1626 he was sent to Ireland by his superiors to engage in the important task of collecting and transcribing the lives of saints throughout the country. This he did and transmitted his findings to Leuven. However, he also engaged on another enterprise ‘to bring to light a knowledge of the antiquity of ancient authors, and a knowledge of the chieftains and nobles that existed in preceding times, in order that each successive generation might possess knowledge and information as to how their ancestors spent their time and life … and what sort of death they met.’ (Mícheál Ó Cléirigh’s dedication of The Annals to his patron Fearghal O Gadhra). He travelled Ireland and collected the stories and manuscripts detailing Ireland’s past and brought his findings back to Donegal, where he was joined by Cú Choigcríche Ó Cléirigh, Fearfeasa Ó Maol Chonaire and Cú Choigcríche Ó Duibhgeannain. Together they compiled Annála Ríochta Éireann and were initially dubbed the Four Masters by another Donegalman, John Colgan. He named them after four medieval commentators on the Franciscan rule. Modern historians will see them in the light of the Counter Reformation movement in Europe and as part of a trend in the continent to write the national story. 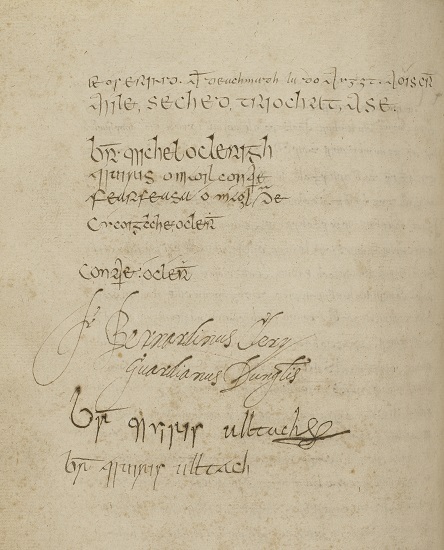 Nevertheless, Mícheál Ó Cléirigh and his colleagues were steeped in the Irish tradition and their work was done in a recognisable format of ‘The Annals’. They also showed a local allegiance by offering an extended dissertation on the O’Donnell clan. 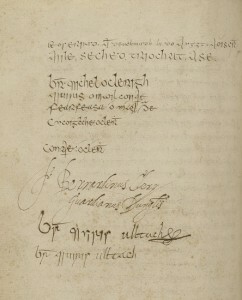 Ó Cléirigh’s Waterford confrere, Luke Wadding, compiled the Annales Minorum, an annalistic history of the entire Franciscan order at about this time also. It is clear Ó Cléirigh was aware of the major changes occurring in the Gaelic order of his day. Donegal was being planted as a consequence of the exile of the O’Donnells and the confiscation of their lands. A whole social and landowning system was in the process of being changed entirely which spelled the end for learned families like the Ó Cléirighs and their associates. Mícheál Ó Cléirigh was clear that his work was designed to ‘rescue the ancient lore of the Irish past from oblivion’. However the work on the Annals did not become available ‘to successive generations’ for more than two hundred years after it had been completed with the publication of O’Donovan’s standard edition in 1849. The work of modern scholars, such as the Franciscans of the last century and historians associated with the Mícheál Ó Cléirigh Institute at U.C.D have provided new insights into Mícheál O’Cléirigh and his work. The Mícheál Ó Cléirigh School will draw from this well of learning.